The current controversy surrounding Elizabeth Warren, a US Senator who has repeatedly claimed Native American heritage, highlights the issue of imposters and ethnic frauds. Senator Warren’s assertions have led many to debate topics of blood quantum, ancestry, and lineal descent, with individuals asking rhetorically what does it mean to be Native American? Overnight, we became geneticists, genealogists, and Indian experts. But, it also draws special attention to the theme of a colonising white majority who have begun to self-Indigenize. 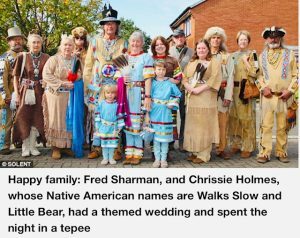 Most Native people will have had countless experiences of people claiming Native American origins through a great grandmother who happened to be a Cherokee princess in their fairy tale family tree. Warren’s story puts that trend squarely in the public eye. Senator Elizabeth Warren, who has repeatedly claimed Native American heritage. Having lived in England for the last 10 years, I have started to notice how much more frequently and insidiously this is happening on a global scale. Most people will have never met a Native American in their life, let alone had a conversation with one, which can lend itself to a mass of people mythicizing, romanticizing, and fetishizing us because there is no one to educate them any differently. I think my first real understanding of how big this was and the profits that were being generated was during a lecture for my Counselling and Psychotherapy course at university. We had a guest speaker who claimed very proudly that she was a certified “shaman,” having learned the traditional, Indigenous ways of some conglomerated version of Native North and South American spirituality. She continued to explain that she had various rattles and “talking sticks” that allowed her to work more therapeutically with her clients. In that moment, this became a very REAL issue of my ancestors being mocked and used as a marketing tool for monetary gain so that non-Natives could get in touch with themselves by paying a white, English woman to perform a “shamanic healing”. From major European corporations, the neighbours next door playing the drum amongst their collection of Native American figurines and photos of wolves, to the person who says their “high cheekbones” confirm their Indianness, I have found myself in a sea of what feels like a “settler” mentality, co-opting my heritage into a homogenised form of what they interpret as Native American, sometimes ignorantly, but oftentimes more blatantly, especially when money is involved. This sense of entitlement has a long history with white privilege manifesting itself in history books, marketing schemes, youth camps, sports mascots, and self-improvement holistic therapies. In Germany, there is documented evidence of their obsession with the Wild West based on the writings of Karl May. Every year, thousands of Germans with a fixation on all that is Indian, dress up in regalia and hold powwows. I have been told that their imitation is so precise it could even be mistaken for the real thing! Sadly, a few Indigenous people attend and dance at these powwows, which does further harm as it acts to legitimize and justify this extreme form of escapism. The problem with all of this is that many don’t understand how this negatively impacts REAL Native American people. According to the 2013 U.S. Census, American Indians and Alaska Natives make up approximately 2 percent of the total population. As a numerical we experience relative invisibility, with most media outlets portraying us as historical relics wearing buckskin or living in tipis. Wannabes always seem to prefer the white-washed version of the “noble savage”. This one-dimensional depiction completely negates the tribal, ancestral, and personal experience of what it means to be a contemporary Native American. Europeans don’t see or understand the poverty, addiction, and lack of formal education that plague many Indian reservations. 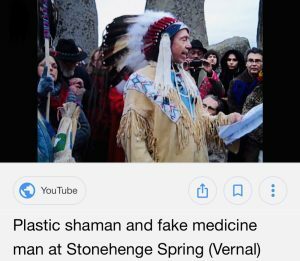 So, while I see these interlopers making money and portraying themselves as shamans, medicine men, or chiefs for some New Age alternative hippie therapies, or holding fake powwows, and creating and selling art that is inspired by a white colonist mindset, I must take issue with this. Why doesn’t anyone want to acknowledge the effects of colonization that has taken its toll on my people? Inter-generational trauma has led to alcoholism and drug addiction and a loss of connection to culture and identity through forced assimilation. When you make a choice to buy or endorse an image or product that claims to be “Native American”, but is made by a non-Native person, you are then deciding to continue to relegate Indigenous people to your idealized notion of who you think we are. Images are powerful and carry weight and can push forward a fictional account through novels, TV, film, art, and historically the Buffalo Bill Wild West shows. They shape our worldview, and without a critically evaluative eye can continue to perpetuate the stereotype of stoic Native caricature, justifying it with the nostalgic childhood memories of playing cowboys and Indians. Despite all of this we as a people have risen, which demonstrates strength and resilience on the part of our ancestors through the robustness and durability of our very existence. We no longer need a non-Native to tell our history. From artists, historians, cultural anthropologists, writers, engineers, activists, law makers, actors, scholars, business owners, doctors, lawyers, and film directors we as a collective are finding our voice and making it known. Through art, museum exhibitions, books, movies, and historical markers we are insisting that people recognize that we are still here, and we are thriving! We write our own narrative. My reality of growing up on the Omaha Indian Reservation is drastically different to the romantic Disney version of Pocahontas. In fact, my relatives made a point of keeping me humble by reminding me exactly how wild and rezzy I was as a child the last time I went home. I was even given the nickname “Zade” at a young age by my older brother, which is an Omaha word meaning messy hair or unkempt. 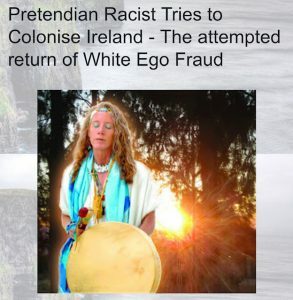 I don’t know if it is an ingrained intuition of ancestral knowledge passed down through the collective unconscious or an act of hyper-vigilant observational skills which renders me able to perceive the details that a non-Native doesn’t realise they are exposing, but there are generally universal signs that clue you in to when someone is pretending to be Indian. However, some people can be very good at hiding in plain sight. Many will feign comprehensive knowledge of their alleged tribe, have outlandish Indian names, generally have little to no factual credence to their claim of ancestral lineage, and will demonstrate acts of moxie by attacking authentic Natives labelling them as imposters to prove themselves genuine. Throughout Europe, people don’t have access to Indigenous cultures like they do in the United States. Which, I think results in even greater liberties taken to create discourse that accepts myths as historical fact. Some will even go so far as to develop a system of political correctness for the heritage they are claiming. I happened upon a pretendian in the high street of the small village that I live in one day. Now, to me he was very obviously a white, English man and was playing what looked like a wooden recorder wearing a grey wolf t-shirt, and brightly coloured fake feathers dangling from his hair, some buckskin pants, and moccasins. As I sat listening and laughing hysterically internally, I overheard some of the conversations that people were having around me. They thought they were observing an authentic North American tribal person playing the flute! I watched in astonishment and anger as people were buying his plastic, chintzy mock ups of “Indian” crafts and wares made in China (mainly dreamcatchers). This man was travelling up and down the country and this was his livelihood. He was being paid to play Indian. In contrast to this experience, I watched a video of a couple in Norway, who decided to get married in an authentic Viking wedding. I thought it was the most beautiful thing I had ever seen. What appealed to me was that these people were completely in touch with themselves and their ancestral roots. They honoured their own people, history, and spirituality. They wore furs, bones, shells, and beads. My hope is that you as the reader learn to deepen your cultural sensitivities, and work alongside us to promote the real Native Americans in art, media, history, and science. Stand with us in solidarity as allies and co-resistors rather than give in to “this colonizing predator mentality”. At one time, we were all tribal people. 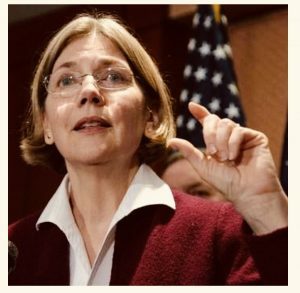 Editor’s note: Warren has been pilloried regularly by Donald Trump, who refers to her as “Pocahontas”. In response to his trolling demands that she prove it, she has recently released details of a DNA test that allegedly suggests she has a small percentage of Native American ancestry (less than 2%). The only problem is that these tests paint with very broad brushstrokes and rely on very limited data that shows only areas of common DNA markers rather than any direct and irrefutable links. Even if they could prove actual genetic ancestry, as many Native commentators point out, having Native ancestry and being part of a Native community are not the same thing. Editor’s note: The term “Indian” is one that has been widely debated with no real consensus being made about the usage of this amongst tribes and sovereign nations. The American Indian Movement (AIM) collectively chose to use this term in 1968. Its origins are related to Christopher Columbus who sought out a passage to India but landed in the Americas. Thus, referring to the residents as “Indians”. For some, this has very negative connotations. However, for others this term has been reclaimed from being a pejorative word to one of acceptable usage. Editor’s note: In settler-colonial societies, the removal of the Native, followed by a kind of mourning/romanticising of their absence can be seen to be an essential stage in the generation of narratives of national belonging – part of the process, ironically, of “Indigenisation” of the incomers.